The sequel to When Calls the Heart, When Comes the Spring brings more laughter and mayhem to young Elizabeth and Wyn’s lives. We follow Elizabeth as she prepares for her upcoming wedding and then follow joyfully along as Elizabeth and Wyn receive Wyn’s new posting and head up the North. Just as Wyn fears, his post is to a remote Indian village in northern Alberta. Will Elizabeth trust Wyn and his knowledge as an obedient wife, or will she continue to struggle in trusting Wyn, who obviously has more experience in this rugged land? Will she survive in the hostile north without a friend or even a women who speaks English? One can only imagine the harshness and ruggedness of the Canadian frontier, but Janette Oke clearly paints a vivid picture of this isolated land. The reader clearly rejoices with Elizabeth as she experiences small gestures of friendship from the Indian women and cries with her over her own barrenness when she so desires a baby of her own. 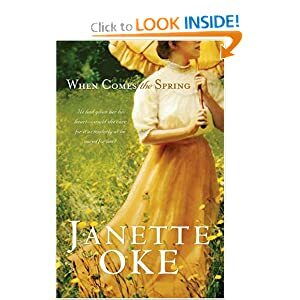 This is another book in the true delightful quality of Janette Oke writing.